Heat a frying pan with olive oil and add the onion, chilli, garlic and ginger and cook until soft. Put the chickpeas into a blender, add the onion mix, coriander and cooked salmon. Blend together and add the egg. Leave to chill for 15 minutes. Check the seasoning. When cool shape into medium sized patties. Chill for 15 minutes (if time allows). 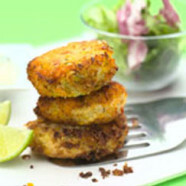 Place the patties into a shallow frying pan with olive oil and fry until golden brown. Remove from the pan and sprinkle with seasoning. Leave to drain on kitchen paper. To make the lime dressing, blend all the ingredients together and chill for 10 minutes. To serve, place the patties on a bed of lettuce leaves. Spoon a small amount of lime dressing on top of the patties. Garnish with a few cherry tomatoes and sprigs of parsley.